Video (00:48) : Sarah McLellan recaps the 3-2 loss to the Sabres in her Wild wrap-up. It may have taken only one goal. Had the Wild gone up 3-0, or even 3-1 to respond after the Sabres tallied their first of the night, Buffalo could have crumbled at the conclusion of a back-to-back on the road. But the lift never came. And the Sabres made the Wild pay for that, rallying for a 3-2 win Saturday at Xcel Energy Center. What seemed to stoke the Wild’s disappointment was that it had the chance to pull away; it had one of its best pushes of the game immediately after the Sabres’ first goal and finished the first period ahead on the shot counter 18-9. And the team started the second outshooting the Sabres 7-0. The Wild won’t have to wait long to get a chance at redemption. It’ll be back in action Sunday, visiting Chicago to take on the Blackhawks – an opportunity it’s eager to embrace after this letdown. “What happened tonight, just put it in the past and the easiest way to do that is getting our game going and come out of Chicago with two points,” defenseman Matt Dumba said. Buffalo didn’t look like a fatigued team when it finished off a two-game sweep in as many nights. Actually, the Sabres worked how the Wild has this season in the second half of a back-to-back since the team is 4-0 in those situations with the chance to notch its fifth win Sunday. 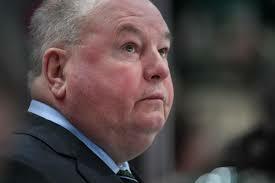 Boudreau could mix up his forward lines to spark more production. While he praised the Marcus Foligno-Charlie Coyle-Jordan Greenway unit, calling it “our best line, easily,” he mentioned Staal and wingers Jason Zucker and Mikael Granlund as “getting too cute.